Aberdeen chairman Stewart Milne is targeting season 2019-20 for a move to a new stadium. Speaking at Monday's annual general meeting, Milne confirmed that Loirston Loch in the south of the city remains the club's preferred choice. 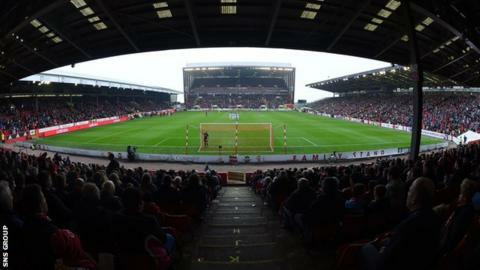 The Dons have been considering a move away from Pittodrie since 2008. "Raising funds over the next 12-24 months could be quite challenging but we would like to think we could be in a new stadium for 19-20," said Milne. "Being realistic, by the time everything is planned out and agreed at Loirston, we'll be well through to the middle of next year and maybe slightly beyond that. "All the different elements need to be re-masterplanned so there is a transport strategy that works for the stadium, the school, the new settlement in development and also the new Cove Rangers stadium. "All of that work is quietly going on in the background." Last month, Aberdeen revealed a record turnover of £13.077m and a profit of £509,000, following the elimination of a near £14.5m debt in 2014. The Dons finished runners-up to Celtic in the Premiership last season and are currently the champions' closest challengers. However, Milne did sound a note of caution, highlighting concerns over the local economy. "We've come through an extremely difficult five or six years and we've started to make real progress," he said. "Most of the clubs have been able to offload the debt they've been carrying and strengthened their financial position. "But everyone recognises what's happening in the north east with the oil sector. If the corporate structure is struggling, that filters down into the streets. "Although we've had a very good year behind us, we are very much aware that big challenges lie ahead." Earlier this year, Aberdeen abandoned plans to develop shared training facilities with the University of Aberdeen.